Thalamic atrophy, subcortical connectivity, and slowly progressive FTD: insights into C9 pathogenicity? Hexanucleotide expansion intronic to chromosome 9 open reading frame 72 (C9ORF72) has recently been identified as the most common genetic cause of both familial and sporadic amyotrophic lateral sclerosis and of frontotemporal dementia with or without concomitant motor neuron disease. Given the common frequency of this genetic aberration, clinicians seek to identify neuroimaging hallmarks characteristic of C9ORF72-associated disease, both to provide a better understanding of the underlying degenerative patterns associated with this mutation and to enable better identification of patients for genetic screening and diagnosis. A survey of the literature describing C9ORF72 neuroimaging thus far suggests that patients with this mutation may demonstrate symmetric frontal and temporal lobe, insular, and posterior cortical atrophy, although temporal involvement may be less than that seen in other mutations. Some studies have also suggested cerebellar and thalamic involvement in C9ORF72-associated disease. Diffuse cortical atrophy that includes anterior as well as posterior structures and subcortical involvement thus may represent unique features of C9ORF72. Although linkage to chromosome 9p in families was established in 2006 , the causative hexanucleotide repeat expansion in a non-coding region of chromosome 9 open reading frame 72 (C9ORF72) was only recently discovered [2, 3]. Expansion of C9ORF72 contributes approximately 20% to 50% to familial [2–5] and 7% to 20% to sporadic amytrophic lateral sclerosis (ALS) [3, 4, 6] and 12% to 20% to familial and 2% to 16% to sporadic frontotemporal dementia (FTD) with or without concomitant motor neuron disease (FTD-MND) [2, 7–9]. Diagnosis of primary progressive aphasia (PPA) has also been documented for some carriers of C9ORF72 expansion [3, 10]. Given that C9ORF72 expansion likely represents the most common genetic cause for FTD/ALS, many clinicians seek to identify features specific to this mutation to assist in the anticipation of disease onset in families and assessment of disease severity in patients. Here we describe the small body of literature on the neuroimaging features of C9ORF72 which has emerged since its discovery. We summarize these features in the context of other FTD-related gene mutations and highlight unique imaging features that may provide insight into the pathogenic role of C9ORF72 expansion. Most neuroimaging studies on C9ORF72 thus far have examined atrophy patterns by using T1-weighted magnetic resonance imaging (MRI) in symptomatic patients with the behavioral variant of FTD (bvFTD) or in combined cohorts of all mutation carriers representing clinical diagnoses of bvFTD, ALS, FTD-MND, and/or PPA. In these contexts, C9ORF72 expansion has been associated primarily with relatively symmetrical (bilateral) atrophy most prominent in the frontal and temporal lobes and the insula (Table 1), which are all regions previously implicated in FTD. Whereas one group found a predominance of temporal atrophy , other studies have found less temporal lobe involvement in C9ORF72 mutation carriers (C9+) as compared with patients with other FTD mutations  and sporadic disease [12, 13]. The group with predominant temporal atrophy was composed of a significantly larger proportion of PPA-diagnosed patients than other studies, which may explain this difference in findings and highlights the heterogeneity in C9+-associated diagnoses. C9ORF72 mutation carriers may also harbor several subtle neuroimaging features that are uncommon in sporadic bvFTD and that distinguish it from other mutations (described in detail in the following section). Most notably, C9+ patients appear to have more parietal and occipital cortical involvement [8, 9, 11–14], so that cortical atrophy often appears quite diffuse (Table 1). This diffuse atrophy pattern is much less common in other genetic and sporadic forms of FTD and may be a hallmark of C9ORF72 expansion. Interestingly, some C9+ patients have been described as clinically affected yet demonstrate no visually detectable brain atrophy [8, 9, 14]; a recent report described two such patients with slowly progressive bvFTD (bvFTD-SP) characterized by a long disease course and non-progressive brain atrophy, and both of them were C9+ . C9+ patients showed atrophy in bilateral frontal, temporal, and parietal and right occipital regions. C9+ patients showed 'predominantly' frontotemporal atrophy in 23% and temporal atrophy in 42%. Thirteen percent showed generalized atrophy, and 9% showed no visible atrophy. Atrophy extended to the parietal region in 31% and included the cerebellum in 25%. C9+ patients, compared with MAPT and GRN carriers, more often showed temporally predominant atrophy. MAPT and GRN were more often associated with frontally predominant atrophy. C9+ patients showed atrophy in the left orbitofrontal cortex, left frontal operculum, bilateral cerebellum, and bilateral thalamus. C9+ patients showed more atrophy in the PFC and cerebellum compared with MAPT carriers and more atrophy in the left PFC compared with GRN carriers. MAPT showed more atrophy in temporal lobe, including hippocampus and amygdala, than C9+ patients. GRN showed more atrophy in the left temporal lobe, postcentral gyri, and inferior frontal gyri than C9+ patients. Fourteen of eighteen C9+ patients showed frontal atrophy. Eight showed temporal atrophy. Five showed parietal atrophy. Three C9+ patients had no detectable atrophy. C9+ patients showed diffuse atrophy involving the frontal, temporal, parietal, and occipital lobes. C9+ patients showed more atrophy in parietal, occipital, lateral, frontal, and cerebellar regions compared with sporadic FTD. Sporadic FTD showed more atrophy in the medial frontal lobe. C9+ patients showed more atrophy in parietal, occipital, lateral, frontal, and cerebellar regions compared with MAPT. MAPT showed more atrophy in the anterior temporal regions. C9+ patients showed di3 use frontal anterior temporal, parietal, and cerebellar and thalamic atrophy compared with controls. C9+ patients without MND showed more parietal and thalamic atrophy than sporadic bvFTD. Sporadic FTD showed more medial frontal atrophy. C9+ patients with MND showed more dorsal frontal, posterior, and cerebellar atrophy compared with sporadic FTD-MND. ALS, amyotrophic lateral sclerosis; bvFTD, behavioral variant frontotemporal dementia; FTD, frontotemporal dementia; FTD-MND, frontotemporal dementia with motor neuron disease; GRN, mutation in GRN gene; MAPT, mutation in MAPT gene; MND, motor neuron disease; nfvPPA, non-fluent variant of primary progressive aphasia; PFC, prefrontal cortex; PPA, primary progressive aphasia. In addition to finding diffuse cortical atrophy, some groups have found involvement of the cerebellum [9–11, 13] or bilateral thalamus [10, 13, 14] (or both) in C9+, which may further distinguish C9+ neuroimaging patterns from those of other mutations and suggests that subcortical changes may contribute to symptoms [10, 13]. Cerebellar findings have been further substantiated pathologically by the presence of ubiquitin/p62-positive, TDP-43-negative neuronal cytoplasmic inclusions in this area in subsets of C9+ FTD/ALS cases included in the aforementioned neuroimaging studies [8–10, 12] as well as others [15–18] and may be a unique pathologic finding associated with C9ORF72 expansion . Little assessment of C9ORF72-associated features has yet been performed using neuroimaging modalities beyond T1-weighted MRI. Findings from multimodal imaging, such as positron emission tomography (PET) or single-photon emission computed tomography (SPECT), are most often concordant with structural imaging findings but can sometimes reveal additional information not readily apparent from MRI alone. In C9+ patients, in whom marked heterogeneity in presentation may complicate diagnosis, complementary findings from other imaging modalities may be particularly informative for confirming clinical and structural imaging findings. For example, Floris and colleagues  presented a case report of a patient with C9ORF72 expansion associated with FTD-parkinsonism-upper motor neuron disease. In addition to presenting with prominent behavioral disturbances consistent with bvFTD, the patient presented with marked visuospatial impairment and hallucinations, which, along with parkinsonism, suggested a differential diagnosis of dementia with Lewy bodies. This patient demonstrated bilateral frontotemporal and posterior atrophy on structural MRI. Perfusion SPECT demonstrated reduced uptake bilaterally in both frontotemporal and parietal regions, consistent with structural imaging findings and the behavioral and visuospatial impairments. Genetic screening confirmed pathogenic expansion of C9ORF72 and a diagnosis of bvFTD . Similarly, Khan and colleagues  described one C9+ bvFTD-SP patient who had no atrophy upon visual inspection of MRI and had a consistent FDG-PET scan showing results within normal limits. These findings, though concordant across imaging modalities, were interesting given the patient's clinical presentation of bvFTD and suggest disruption of behavior in the context of limited visible changes on both structural and metabolic imaging. Even within a survey of six more 'typical' C9+ patients, Boeve and colleagues  described a variety of findings from SPECT and PET imaging. In five carriers, SPECT demonstrated significant hypoperfusion in the anterior and middle cingulate gyri in comparison with controls. In one of these patients, there was no visual atrophy in structural MRI at the time of SPECT imaging, and frontal cortical atrophy was more evident only on structural MRI two years later , suggesting that early changes in hypometabolism preceded cortical atrophy. In four of five patients who underwent FDG-PET imaging, anterior cingulate demonstrated significant hypometabolism; posterior cingulate metabolism was normal in all four patients, and frontal cortical hypometabolism ranged from mild to severe . Interestingly, the fifth patient demonstrated hypometabolism in parietal/precuneus regions with relative sparing of frontal cortical regions, a pattern more consistent with Alzheimer's disease than FTD/ALS. These findings, though not directly comparable, indicate that multimodal imaging sometimes may reveal abnormalities not detectable with structural MRI alone. This is particularly true when characterizing atypical clinical presentations and also establishes a breadth of imaging variability across C9+ patients. This high level of heterogeneity across individuals reflects the multitude of clinical phenotypes associated with C9+ and may distinguish C9ORF72 expansion from other FTD-associated gene mutations, which are described in the next section. Previous studies have assessed the neuroimaging characteristics unique to other FTD-spectrum gene mutations, most notably in granulin (GRN), which encodes the protein progranulin and results in TDP-43 pathology, and in MAPT, the gene coding for the tau protein, which characterizes the other major type of FTD pathology. MAPT mutation carriers are generally characterized by relatively symmetrical atrophy predominantly in the anterior and medial temporal lobes, orbitofrontal cortex, and fornix [7, 20]. Whitwell and colleagues  also found cerebellar involvement in MAPT mutation carriers. In contrast, GRN mutations are often associated with strongly asymmetric atrophy, affecting either hemisphere and involving the inferior frontal, temporal, and parietal lobes, with additional white matter involvement [7, 20]. Examples of typical atrophy patterns in MAPT, GRN, and C9ORF72 mutation carriers are shown in Figure 1. Representative magnetic resonance images for the three most common frontotemporal dementia (FTD)-causing gene mutations. 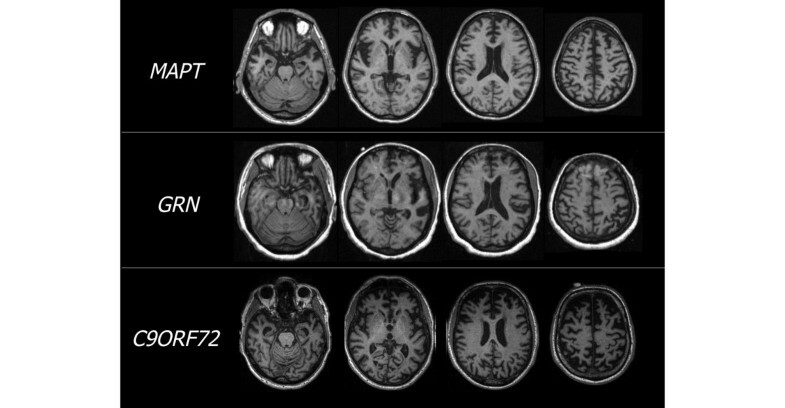 T1-weighted magnetic resonance images are shown for three different patients, each harboring a single mutation in a different gene that causes FTD. The patient with MAPT demonstrates symmetrical atrophy in ventral frontotemporal regions, particularly in the anterior temporal poles, whereas the GRN mutation carrier demonstrates marked asymmetrical atrophy, most notable in dorsal, frontotemporal regions, with additional involvement in posterior areas. However, the patient with C9ORF72 expansion shows diffuse, symmetrical atrophy in frontal, temporal, and parietal cortical regions as well as cerebellum. C9ORF72, chromosome 9 open reading frame 72; GRN, granulin; MAPT, microtubule-associated protein tau. Whitwell and colleagues  performed modeling to identify neuroimaging predictors of C9ORF72 expansion as compared with GRN and MAPT and found that smaller left sensorimotor cortices, right occipital lobe and left cerebellum, and larger left inferior temporal lobe all independently contributed to a prediction of C9+ status. Using 14 of 39 total regions of interest, they could correctly classify C9ORF72 mutation carriers with 74% accuracy and achieved 93% classification accuracy with 26 variables . Although neuroimaging hallmarks are more likely to be used in conjunction with, rather than in place of, molecular genetic and family history information , the ability to accurately identify C9+ patients from other FTD mutation carriers further supports the hypothesis that different genetic lesions result in different patterns of brain atrophy. Identification of gene-specific neuroimaging hallmarks may provide insight into the underlying pattern and type of pathology, which could be important information in the advent of pathology type-specific therapeutic interventions or for use as a biomarker in clinical trials. Previous studies have suggested that FTLD-TDP-43 type may be consistent with specific patterns of structural atrophy [22, 23]. Both TDP-43 (harmonized ) type A and B pathologies have been associated with C9+ FTD/ALS [8–10, 16–18] and are broadly consistent with neuroimaging hallmarks for each: type A (Mackenzie type 1, Sampathu type 3) was associated with more dorsal frontotemporal, inferior parietal, striatal, and thalamic atrophy, and type B (Mackenzie type 3, Sampathu type 2) was associated with relatively symmetrical posterior frontal, medial temporal, prefrontal, orbitofrontal, and insular cortex atrophy [22, 23]. The association of neuroimaging findings and pathology in less common clinical presentations of C9+ cases, however, remains to be determined. The role of genotype in changes in brain structure over time provides another insight into early hallmarks of disease and its underlying phenomenology. Although the sample size was small, Mahoney and colleagues  found that annualized rates of brain atrophy were greatest in GRN (n = 4) carriers, followed by carriers of C9ORF72 (n = 5) and MAPT (n = 6), although mean atrophy rates did not differ significantly between groups . Previously, Whitwell and colleagues  demonstrated similar findings whereby GRN mutation carriers had higher annual rates of whole-brain atrophy in comparison with MAPT mutation carriers. Boeve and colleagues  reported on at least 2 years of longitudinal follow-up in eight C9+ patients, who showed progression of atrophy specifically in frontal lobes and ventricular enlargement. Previously, GRN mutations were shown to exhibit asymmetric volume loss mainly in inferior frontal, superior temporal, and inferior parietal lobes, precuneus, and cingulate cortex over time . In MAPT mutation carriers, longitudinal volume loss is symmetric and involves anteromedial temporal lobes, orbitofrontal cortex, and white matter tracts, including corpus callosum . Of note, Khan and colleagues  described two patients with bvFTD-SP who demonstrated no significant brain atrophy over the course of 3 years and 8 years, respectively; the seeming lack of progressive atrophy contributed some uncertainty to the patients' initial bvFTD diagnosis. A small minority of patients with mutation in C9ORF72 have been described with similar absences of visible brain atrophy in MRI [8, 9], and this stands in stark contrast to the often insidious progression of volume loss displayed with the other main gene mutation causing TDP-43 pathology, GRN. The possibility that some patients harboring C9ORF72 repeat expansion may not show progressive brain atrophy thus seems quite unusual in comparison with other mutations, and it will be important to investigate potential factors that modify rates of progression, including the number of hexanucleotide repeats, as the technology becomes available. Broadly, MAPT atrophy is symmetric and more ventral whereas GRN atrophy is asymmetric and more dorsal , and this difference may reflect degeneration in different functional networks that may be selectively vulnerable to FTLD . Although initial lesions (genetic, developmental, environmental, and so on) may differentially determine which brain region is first affected, studies in FTD mutation carriers as well as in other diseases strongly suggest that once a degenerative process is set in motion, that process will continue in a circumscribed pattern  that may be determined by connections reflecting intrinsic organization of functional brain systems . Zhou and colleagues  suggest that neurodegenerative processes may begin within a single 'epicenter' and spread through a specific network of functional paths. In the case of mutation carriers, genetically mediated vulnerability may enhance this spread. Two key questions thus remain: how does C9ORF72 expansion alter vulnerability, and upon what path does it tread? Findings from published neuroimaging studies thus far suggest that subcortical structures, including the thalamus and cerebellum, may be uniquely affected by mutation in C9ORF72. As reviewed by Schmahmann and colleagues , these regions are both interconnected with the entire cerebral cortex. If these subcortical regions serve as the epicenter for C9ORF72 pathology, then their diffuse cortical connectivity may be a clue to the mechanisms leading to the diffuse cortical involvement that seems characteristic of this mutation. Subcortical involvement may also explain the development of symptoms even in patients who have relatively little cortical atrophy. In a meticulous review, Schmahmann and Pandya  describe disconnection syndromes that can occur in the context of specific subcortical involvement of the basal ganglia, thalamus, and cerebellum. The authors propose that neural architecture determines function, that specific connections between subcortical nodes define behavior, and that fiber tracts linking cerebral cortical regions to one another enable the coordination necessary for complex behaviors . In this framework, changes in the connectivity of these subcortical structures with the cortex could account for some of the behavioral, executive function, and motor symptoms that have recently been associated with C9ORF72 FTD/ALS, even in patients who show relatively little cortical atrophy. This hypothesis will have to be addressed in future studies integrating structural and functional imaging methodology and linking them to symptoms [13, 31]. Mutation carriers with FTD demonstrate prominent symmetric atrophy in frontal and temporal lobes and insula. Main hallmarks specific to C9ORF72 may include relatively diffuse changes that involve posterior as well as anterior cortical regions and bilateral thalamic and cerebellar atrophy. Involvement of temporal lobes does not appear to be as prominent in C9+ patients with bvFTD but is still seen in those with PPA. Occipital and cerebellar atrophy and relative sparing of temporal lobes may be distinguishing features of C9ORF72 relative to GRN- or MAPT-associated disease. Finally, in some expansion carriers, atrophy may not be apparent upon visual inspection of MRI despite clear clinical symptoms, and this may reflect the effects of disease on subcortical structures. Although significant efforts have been undertaken to characterize C9ORF72 expansion carriers, much of this work has been performed on incomplete archival data or samples of convenience, resulting in diverse datasets and study designs that can be difficult to compare directly, particularly in small cohorts. Future investigations of neuroimaging characteristics in C9ORF72 expansion carriers will require careful clinical characterization and study designs that are properly controlled with respect to diagnosis and image ascertainment. Comparisons of C9+ FTD with sporadic disease may further complement work comparing C9ORF72 expansion with other FTD-causing mutations. Furthermore, very few studies have examined the imaging features of C9ORF72 in modalities other than T1-weighted structural MRI. While neuroimaging for diagnostic assessment of mutation carriers will most likely complement--rather than replace--molecular genetic characterization, these signatures may serve a significant role in earlier identification and diagnosis of patients with mild behavioral syndromes or family histories of unknown etiology or both. In addition, neuroimaging may serve a critical role in the prediction of symptoms and in the assessment of drug effects during treatment trials, particularly during preclinical stages of disease. In the future, functional assessment of connectivity and subcortical network mapping may shed light on the mechanistic underpinnings of C9ORF72 pathogenicity, particularly in the context of visually undetectable brain atrophy, and may complement structural imaging in diagnosis and longitudinal assessment. JSY was funded by a diversity supplement from the National Institute on Aging-National Institutes of Health (P50-AG023501-08S1, principal investigator: Bruce L Miller). The work was also funded by AG019724.